It’s no secret I love heritage cookbooks. Mum bought me a gem this week – Pioneering Recipes of Dalby and District. Published by Northern Downs News in 1984, it’s brimming with old recipes and tips for cleaning white kid gloves. My blog of course, has no business keeping anything white much less mentioning kid gloves so I’ll spare you those tips. Dalby’s pioneers (and my ever expanding collection of vintage cookbooks) has inspired me to carve a new facet for my blog, so I bring you the very first Time-worn Tucker post. My plan is to rediscover and showcase forgotten recipes. With inspiration from old cookbooks and reader suggestions, I’m hopeful of finding some real treasures. Fricasse of Kangaroo Tail, anyone? I’m willing to tackle offal, but draw the line at wildlife. Not surprisingly I’ve discovered recipes for both…. Catch a snake ensuring that the snake does not bite you or itself. Gather a handful of salt leaves and throw into the fire, then place the snake into the coals with the head tied to the tail. Throw another handful of salt leaves into the circle of the snake and then spread gum leaves onto the body. 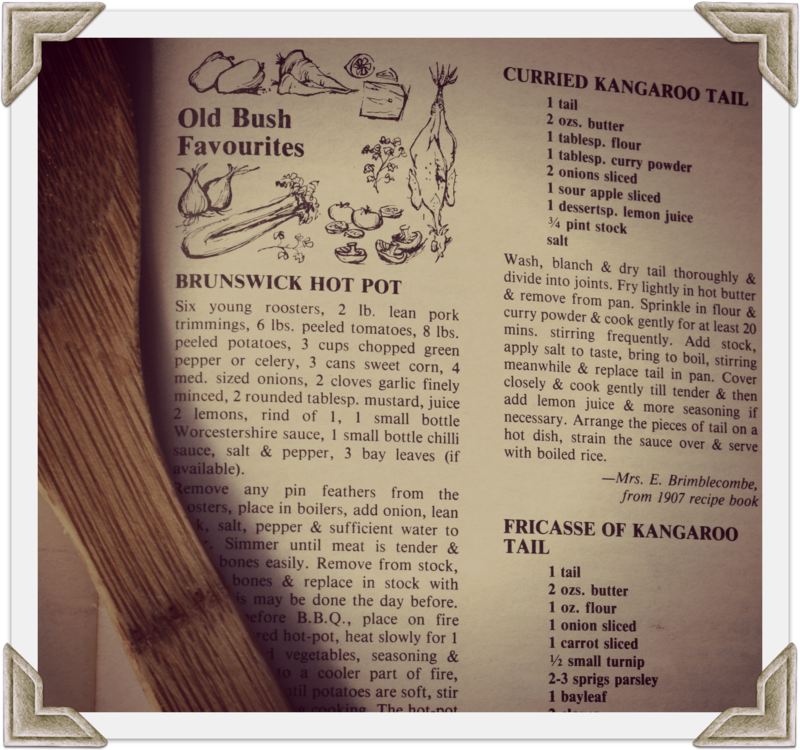 It is best to use the flowering gums as the flavour goes through the meat. Using two sticks remove the snakes from the coals and put onto a nest of leaves. Take a chunk of meat and squeeze lemon juice onto it. It tastes similar to chicken. Adds new meaning to “your mother wears army boots” huh? My first Time-worn Tucker recipe is a little more mainstream than Mrs Swann’s Seasoned Snake. I suspect it may be a little more palatable too. Sift together the flours. Add the well-beaten egg, then the milk and whisk until smooth. Serve at once with tomato sauce. This one is a husband pleaser – Bearhands loves fritters. They’re are a great way to revamp leftover cold meat. This batter can be used for sweet or savoury fritters. It’s simple and easy and pleasing – all qualities of a satisfying mid-week meal. Do you have a favourite childhood food memory you’d like me to track down? A recipe you’d like to challenge me to make? Leave a comment & I’ll do my best! What a great idea for corned beef. We eat a lot in this house because the kids like the texture better than other meat. My Nanna used to make bikies that were just plain but were stuck together with icing – not melting moments but similar. I should just ask her if she has the recipe shouldn’t I? I suspect we are Anne! I’ll do my best to track down your rolly-polly recipe – keep you posted. Your blog is terrific Amanda, just wanted to say. I love the way you are doing your photos and anytime you do a tutorial post on how you do them, I will be clicking straight there. Now then, do not mention the word fritter to me. We had Spam fritters as a child once or twice, yurk! When I was a child, I loved the kedgeree Mum made, with smoked fish, eggs, rice and a vast amount of butter. My kids would faint at the sight. Spam fritters? They sound as appealing as seasoned snake and sea lice! I don’t think I’ve ever had kedgeree – but I’m up for a challenge. I’ll try to find a recipe for it. Funny….I draw the line at native wildlife as well….I just can’t do it!! It makes me think of “The Gruffalo”! oh my gosh that’s hysterical – “Catch a snake ensuring that the snake does not bite you or itself.” do snakes bit themselves when caught? Love the corned beef fritters. I’ve seen snakes bite themselves when they’re in pain – like run over by a car. What a great idea….I’ve seen recipes for food at the Elizabethan tables and stuff (I think that’s where turducken comes from). It’s amazing to see how far we’ve come with gastronomy. Let me know how you go with smoking your snake. Call me a big girl’s blouse but I might just stick to the fritters. 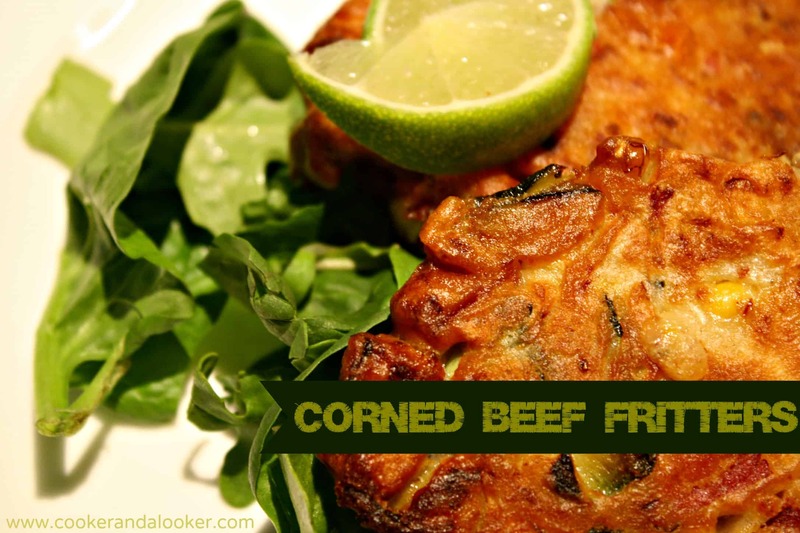 A childhood family friend referred to corn beef fritters as “race horses”. I like the way these have a few sneaky vegetables in the mix for the kids. Love corned beef but only know one recipe! These fritters look fab. The snake? Not so much…eek! I find corned beef such a comfort food. Might make these and add a white cheese sauce. Yep tomato sauce all the way. I’ve seen both self raising and a mix of plain and self raising mentioned for these, as a MM – what’s the pros and cons? Sorry Brad – I lost that cookbook in an unfortunate car park incident not long after. LUCKILY i know how to catch snake, native foods always have a season for when to eat what. Native people who still remember the ways, know that its a ridiculous waste of time and energy to catch or gather food to eat when its not at its best. I really love the fact that you’ve got that old book!!! As kids we loved puftaloons and golden syrup, treacle sponge and jam roly-poly with hot custard, all of which we were told would give us nightmares if we ate too much. Mock fish, bubble & squeak and corned beef (home cured) for breakfast. Really? From me Em? Weird. More old-school food you reckon? Consider it done! I’m 5th Generation from Southern State of Mississippi in the US. I too love the old receipts. I have saved many from my grandmother born in 1915. I’ve had snake prepared in several ways along with most everything else that flies, crawls, walks or slivers. I loved corned beef and plan to try this receipt tonight and sneak it past my kids. I have an interesting receipt for a “Bear Loaf” Ha! I’ve prepared with with beef or venison but no bear as of yet. Bear Loaf? I need that recipe Doc! Would you consider a guest post? I remember this recipe from my mother’s, “Common Sense Cookery Book”. Having found myself with 1kg of excess silverside I went in search of the recipe and landed here. Absolutely delicious!! My kids are begging me to make them again. I’ve now stumbled across your sago recipe so I think I might give that a go next! We always ate & still eat Burdekin Duck…that is corned fritters with tomato & onion rather than other vegies. BTW…my Sister’s bikkies were shortbread & the ‘icing’ is condensed milk hardened with lemon & something else, maybe melted butter.